A talented young London tosher (sewer scavenger), going by the name of Dodger (because the one he was given at the orphanage was so awful), rescues a young woman escaping from a coach one dangerously stormy night, and stumbles into a meeting with Charles Dickens and Henry Mayhew. The young woman is not willing to give her real name, but she clearly needs shelter, as well as protection from those she was escaping from. Despite initial mutual distrust, the tosher and the two gentlemen are soon working together to solve the mystery of the young woman whom Mrs. Mayhew quickly names Simplicity. It's clear very quickly that Simplicity is hiding from powerful people, and Dodger, while putting his street skills to good use, also finds himself in very unexpected company, meeting Benjamin Disraeli, Sir Robert Peel, and other alarmingly prominent and powerful people. He also encounters slightly less alarming people, like Sweeney Todd, the Demon Barber of Fleet Street. It's an education, and an eye-opening experience, for Dodger, who starts to realize there are things in life that he might want, that can't be supported by even a very successful tosher. 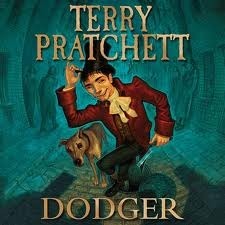 This is an adventure through Dickens' London, seen through the filter of Pratchett's wise and funny insight.